Court action over Newcrest’s Cadia Valley operations put the company’s release of information in the spotlight. Newcrest has copped a lot of flak lately for “selective briefings”, that is, providing information to a handful of favoured analysts without making an announcement to the broader market so the “mums and dads” get a chance to trade on the news too. As revealed earlier today, it is likely that the big gold miner’s investigation into claims of selective briefings will deliver a head on a platter, a scapegoat. And this scapegoat will conveniently cloud the greater issue of accountability for Newcrest’s $6 billion suite of write-offs, of which the calamitous acquisition of Lihir contributed $3.6 billion in red ink. Against this backdrop, the overzealous actions of inexperienced employees pale in comparison. Newcrest chairman Don Mercer has commissioned former ASX chairman Maurice Newman to report on the matter. BusinessDay understands the market had largely anticipated the write-downs related to Lihir and other projects hit by a falling gold price. It is the production forecasts for 2014 that were not “in the market”, or generally known at the time by analysts, and that may be central to Newman’s investigation. As the class action lawyers circle – there are potential claims for shareholder losses arising from the sharp fall in the share price between the time the analysts were briefed and the general market became aware of the extent of Newcrest’s woes – a debate has raged over selective briefings. Purists argue that no briefings should be made at all to key brokers and fund managers, any information should be provided up front by an announcement to the broader market. This view has merit, yet in reality it is unreasonable to expect that big shareholders and influential analysts will not enjoy greater access to company management than retail shareholders. If, for instance, a super fund owns 7 per cent of the stock, it would be hard for management to fend off a request for a company visit, or a background chat. The matter of selective briefings is not black and white. It is the domain of “guidance”, technical discussions about accounting treatments, competitors and industry dynamics. It is the domain of nods and winks, nuance and conclusions drawn by body language. Selective briefings are a grey area. What constitutes the dissemination of “material information”, that is, information that can rock a share price? Of course, if there is a significant event – or something clearly sensitive to earnings – the news of it should be made openly to all at the same time via a company announcement. But the provision of information is not a science. It is hard to measure, and equally hard to legislate for. Arguably, Newcrest made another selective briefing only a couple of weeks before its big earnings confession in June. Following a story the share price tanked and the company complained that it had been unfairly treated in the press. At issue, a small explorer, Gold & Copper Resources, had had a minor win in the courts in relation to an exploration licence awarded by the NSW government to Newcrest near its huge Cadia Valley operations. Gold and Copper has five actions in train relating to licences in the area. Cadia is the biggest underground gold mine in Australia. Although the decision of the court had been handed down three days before the press article, Newcrest had not deemed it to be “material” and had not announced it to the market. Moreover, the company told BusinessDay that it had “won” the action. The licence in question had not been “quashed”, it said. Although it made no announcement to the market about the lawsuit as its shares were falling, an analyst’s report from Credit Suisse soon emerged, headlined “First Blush – Land and Environment Court rules in favour of Newcrest – a Second Win”. The report noted that “all four allegations against Newcrest dismissed in today’s Land and Environment Court judgment, but the minister directed to reissue a licence”. It also said that there was no impact to Cadia or Newcrest as a result of the decision. The stockbrokers may well be right in their appraisal that there would be no material effect on the giant goldminer from the court actions. Though it is too early to tell. However, the market remains as uninformed as ever. Here was a leading broker saying Newcrest had a “win”. Newcrest to this day claims it had “won”. When asked if the company had briefed the stockbrokers in relation to their note concerning its “win”, Newcrest declined to either confirm or deny. It is reasonable to assume there were communications between the two. Whether the information provided to the broking analysts was material or not – it was almost certainly not material in the sense of immediate sensitivity to company earnings although arguably material to market sentiment – it was wrong. The first order by Justice Pain said “the decision by the First Respondent (Newcrest) to renew Exploration Licence 3856 made on 14 March 2011 be quashed”. In Newcrest’s market release it stated, “The decision of the Court relates to a legal action brought by Gold and Copper Resources Pty Limited (GCR) against the Minister and Newcrest”. This was not correct either. Gold and Copper had brought the action against the Minister and subsequently Newcrest asked to be joined in the case. As to the claim that “only one of Gold and Copper’s four claims was established in the judgment”, the court actually found in favour on two counts: 1. that the Minister did not have power to renew EL3856 over two additional units that were not part of EL3856 immediately prior to the renewal. And 3, that the Minister was not, and could not have been, satisfied that special circumstances existed to warrant renewal of EL3856 for 100 per cent of the area sought by Newcrest. 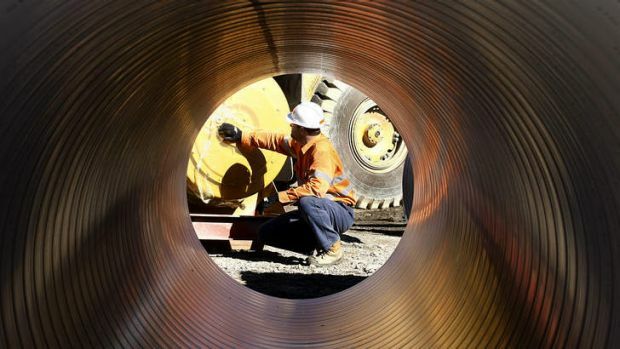 Gold and Copper went down on the other two points but that should hardly have been framed as a Newcrest “win” when a licence renewal had been “quashed” over substantial exploration ground next to the country’s biggest underground gold mine. This situation of the market being not properly informed stood, indeed it still stands, until two weeks ago when Justice Pain handed down a costs order in favour of Gold and Copper. She observed in the order “Gold and Copper’s substantial success in the proceedings” and said Gold and Copper obtained “all the relief it sought. It was not partially successful”. Whether the suite of lawsuits relating to these NSW licences goes anywhere, is anyone’s guess. Litigation is a lottery. But it is precisely this uncertainty of outcome in litigation that constitutes a corporate risk. And that corporate risk ought to be adequately disclosed. In Newcrest’s defence – and this goes for every big company being pursued in the courts for these sorts of things – there is perhaps no need to issue an ASX release every time there is an incremental court outcome. In this event though, Newcrest had earlier told the ASX that the claims had no merit. What can be done then? If a company deems that the information is not material then it is well within its rights not to bother with an ASX release. But given the significant resources allocated to investor relations and PR these days it is probably a good thing to put notice of any actions, and their developments, on the company website. A simple link to the court judgments would suffice. The technology and the resources are available. In this way, there would be less scope for misunderstanding and spin when such situations arise.